The HX15 series two wire remote transmitters measure relative humidity and temperature over a large temperature range (-40 to 180°C). 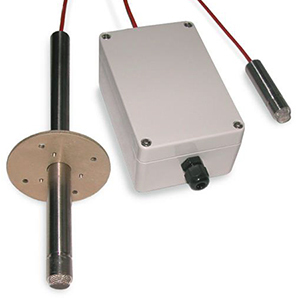 The HX15-W 64 mm (2.5") stainless steel probe is used for wall mounting. The HX15-D 216 mm (8.5") stainless steel duct probe has a removable flange. The probes are connected to housings with 1 m (40") PFA cables. Probes are not field replaceable.